Last night Beyonce appeared backstage on SNL to support Solange! After the show, the family celebrated at a restaurant. 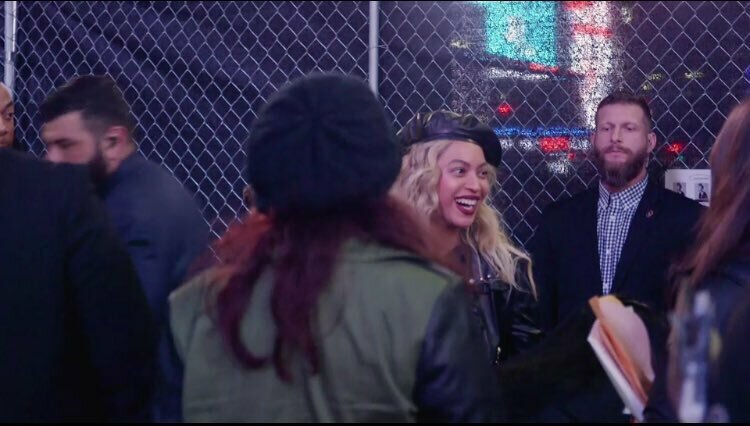 Beyonce attended Alicia Keys' 'Here' in Times Square concert on October 9 and now we can see her in a new behind the scenes video (0:25 mark)! Beyonce and Jay-Z attended the game between the Golden State Warriors and San Antonio Spurs on October 25, 2016 at ORACLE Arena in Oakland, California. Beyonce was spotted last night leaving Barclays Center after the Tidal X: 1015 concert. UPDATE: Later, the singer was photographed at the Pasquale Jones restaurant. After the last show of the Formation World Tour on Friday, Beyonce celebrated with friends at a restaurant. Beyonce was spotted yesterday out and about in New York City. First, she visited her mother's apartment then, her office building and finally, the Pasquale Jones restaurant. Beyonce was spotted yesterday leaving her office building in New York. Beyonce was spotted yesterday leaving the Bagatelle restaurant in New York after a Formation World Tour wrap party. Beyonce and her family attended the Chicago Bears vs. Dallas Cowboys game at AT&T Stadium on September 25 in Dallas. Watch fan videos on Twitter: 1, 2, 3, 4, 5, 6, 7. Beyonce was spotted yesterday in New Orleans. Beyonce visited the Solid Gold Beauty Supply store in Houston on Friday. Later in the day, the singer was spotted at Solange's house in New Orleans. Beyonce was spotted leaving the No Name club in Los Angeles on Wednesday. Last night Beyonce and Jay-Z attended Kanye West's Saint Pablo Tour at Madison Square Garden in New York. Beyonce was spotted leaving The NoMad Hotel yesterday in New York. Last night Beyonce celebrated her birthday at a Soul Train themed party in New York City. Watch videos on Twitter: 1, 2, 3, 4, 5, 6. Beyonce attended day 2 of the 2016 Budweiser Made in America Festival at Benjamin Franklin Parkway on September 4, 2016 in Philadelphia, Pennsylvania. You can watch tons of videos on Twitter: 1, 2, 3, 4, 5, 6, 7, 8, 9, 10, 11, 12, 13, 14, 15, 16, 17, 18. Beyoncé and her daughter Blue Ivy have touched down in Maryland, apparently set to spend Labor Day weekend with the Obamas at Camp David. But, with Barack having jetted off to China for the final G20 summit of his presidency, it looks like the holiday weekend will double as a girls' weekend. The megastar was spotted stepping off a private plane in Frederick, Maryland, on Friday afternoon. Moments earlier, four-year-old Blue Ivy climbed down the steps in front of her mom, getting a helping hand from a security guard as she stepped onto the tarmac. Beyoncé was wearing a white top, blue jeans and carried a pink bag as she walked towards an awaiting motorcade, while Blue Ivy had on a blue and white checkered dress and white sneakers. Beyonce and Jay Z attended Serena Williams second round victory over Vania King from Serena's player box at Arthur Ashe Stadium on day 4 of the 2016 US Open at USTA Billie Jean King National Tennis Center on September 1, 2016 in the Queens borough of New York City. Beyonce and Blue Ivy were spotted yesterday in New York City. After taking a walk in Battery Park, they visited the Bergdorf Goodman store. UPDATE: Beyonce shared personal photos from the day on her website.